Karin Kettenring and Heather Baron collecting leaf samples in a patch of non-native Phragmites australis. Species invasions are often not noticed until they have spread extensively. Non-native Phragmites australis has spread throughout the Chesapeake Bay, covering wetlands and excluding native species. The goal of this project is to use ‘forensic’ techniques to interpret patterns of genetic variation to understand what has driven Phragmites spread. As part of a $5 million grant from the National Oceanic and Atmospheric Administration (NOAA), SERC is leading a team from 7 institutions to investigate the combined effects of 'multiple stressors' on nearshore habitats throughout the Chesapeake region. Invasive species, nutrient runoff and shoreline hardening are just a few of the factors contributing to the decline of these critical areas. Dennis Whigham measures the length of a patch of Phragmites along the shore. 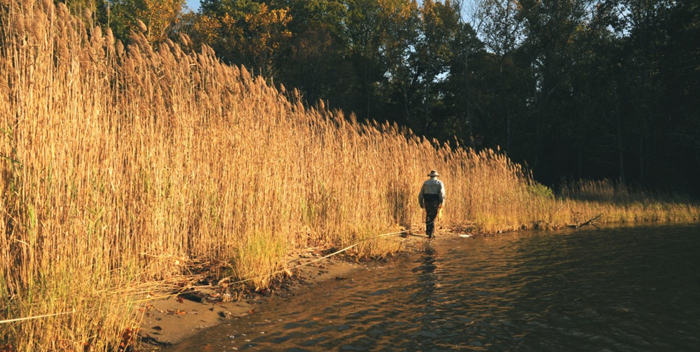 Work on this project at SERC has focused on the non-native genotype of common reed (Phragmites australis), which has become a major invader of brackish wetlands in the Chesapeake Bay region and elsewhere throughout North America. Species invasions generally start with just a few colonists. How quickly those initial invaders establish and begin to expand rapidly can vary dramatically. We have a native subspecies of the wetland grass, Phragmites australis, but a non-native type was introduced from Europe, likely sometime in the 1800s. Although this non-native plant has been in the Chesapeake Bay for around 200 years, it only began to spread rapidly in the 1980’s and 90’s. What triggered this sudden explosion took an interpretation of patterns of current genetic variation, much as a forensic scientist would examine the current patterns at a crime scene, to understand what happened to get to this point. 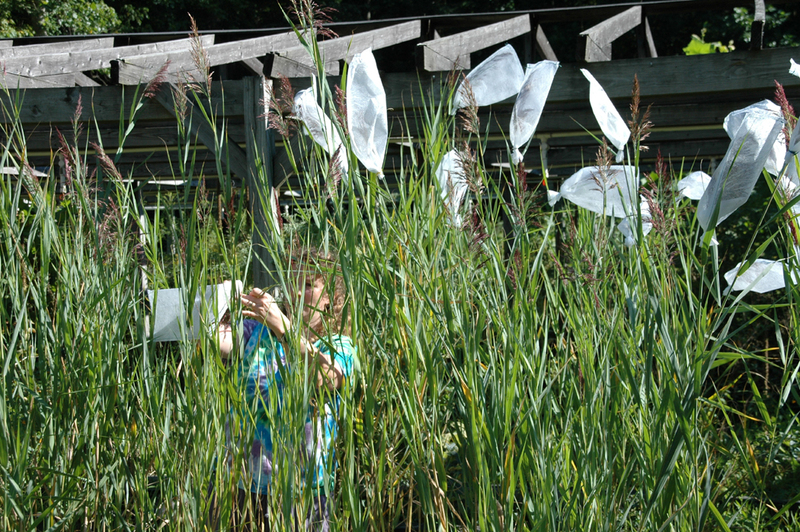 Melissa McCormick attaching pollination bags to Phragmites plants in an experimental garden. In a collaboration with Karin Kettenring (Utah State University), we demonstrated that Phragmites invasion is linked to the level of genetic diversity contained within patches. We found that Phragmites needs to have more than one genotype in a patch to produce significant numbers of viable seeds. This explained why Phragmites, which first invaded the Chesapeake Bay over 200 years ago, has only recently begun to spread explosively. Only after multiple genotypes became established close together, which appears to have taken many years to happen after initial invasion, were enough seeds produced to fuel further spread. This work has been published in Journal of Ecology, Wetlands, Journal of Applied Ecology, and Restoration Ecology. We further extended this study, in collaboration with USU PhD candidate Eric Hazelton and intern Matt Sievers, to understand how the process of Phragmites invasion has changed over time. We examined patterns of genetic differences within and among some of the first patches of Phragmites that established in two rivers and compared them with some of the more recently established patches. We were able to interpret the patterns of genetic differences to determine that the first patches in each subestuary were likely established by rare seeds that entered from elsewhere in the Chesapeake Bay. When genetically different Phragmites eventually became established close together, they began to produce seeds that led to the first big flush of Phragmites patches that were established after 1970. These patches had patterns of genetic relatedness that showed they were founded by many locally-produced seeds, rather than the few, rare seeds from outside the subestuary that founded the older patches. This helped us to understand how the Phragmites invasion has progressed in these subestuaries and to predict how it might progress in less extensively-invaded subestuaries around the Chesapeake Bay. This work was published in Wetlands and was the subject of a SERC blog post.